The Manasoo sank in Georgian Bay during September 1928. A storm wracked the ship, which pointed out a pretty damning problem: there was something wrong with the stern, and it was filling up with water in the middle of the night. At that point, they were, for all intents and purposes, screwed. Only five folks survived the sinking, but sixteen crew and passengers (along with about one hundred cattle) succumbed to the sinking. Divers today have found the ship in a pretty incredible condition—it’s about as perfectly preserved as you could hope a shipwreck would be. That means that the Chevy doesn’t look all that different from what it must have when it rolled on board in 1928. The car belonged to one of the passengers. 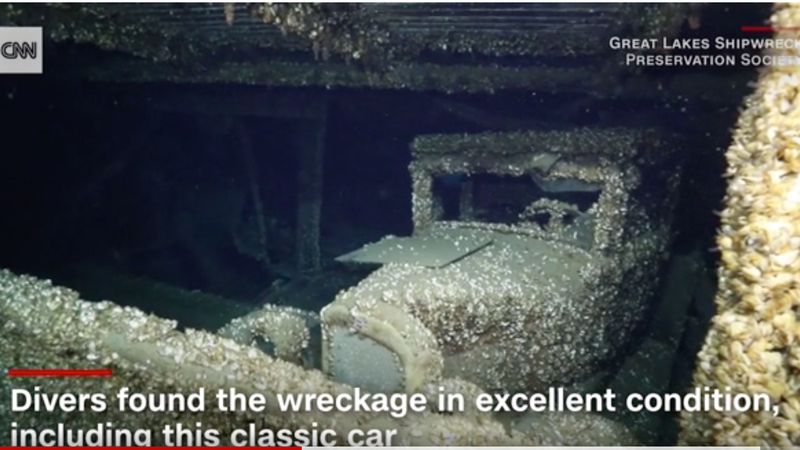 The folks at the Great Lakes Shipwreck Preservation Society are pretty certain that the ship won’t be able to be brought to the surface—but they are hoping to retrieve and conserve the car for display in a local museum.